A spirited recital closer! This energetic showpiece exploits both the full range of the keyboard and the player's palette of pianistic color and articulation. The sprightly sixteenth-note passages in C major are contrasted with a warm, lyrical section in E-flat major. A vivid study in staccato/legato contrast, two-note phrases, use of the damper pedal as a coloristic device, and cross-hand notes, this piece not only sounds impressive, but is great fun to play. 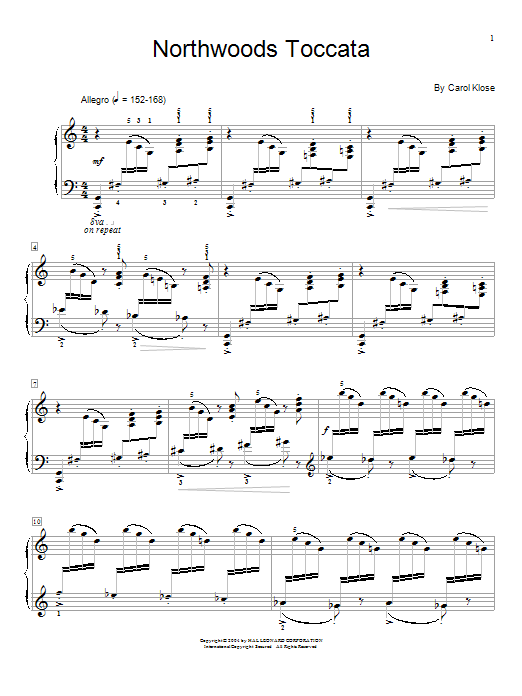 (HLSPL Level 5) piano solo. ABA form; 4/4 meter; Allegro tempo; C major/E-flat major; 101 measures. Timing: 3:20.